The first official marathon was held on September 20, 1997, celebrating the 50th anniversary of the Air Force, and is held the third Saturday in September each year. 2016 marks the 20th year and will be held September 17, 2016. To commemorate our rich history in flight, each year one aircraft is chosen to be highlighted during the marathon and on the unique finisher’s medal presented to each race participant. The marathon course is a 26.2-mile run that traverses historical places on Wright-Patterson Air Force Base, including the National Museum of the United States Air Force, the Air Force Institute of Technology, Headquarters Air Force Material Command, the Wright-Patterson AFB flight line, Huffman Prairie Flying Field, and the Wright Brothers Memorial Monument. 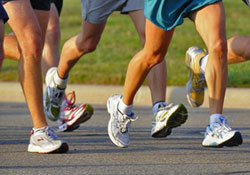 All levels of runners participate from around the world in the marathon, wheelchair, half marathon, 10K, and 5K races. The Air Force Marathon course is certified by the USA Track and Field Association and is a Boston Qualifier. *These categories are no longer offered.